An attractive, and spacious character cottage situated in a small hamlet between Horsham and Rudgwick. The property has been significantly extended over the years to provide a most comfortable family home, featuring four double bedrooms and two bathrooms on the first floor. On the ground floor there are three reception rooms including the superb triple aspect sitting room with 9' ceiling, a formal dining room and a snug. 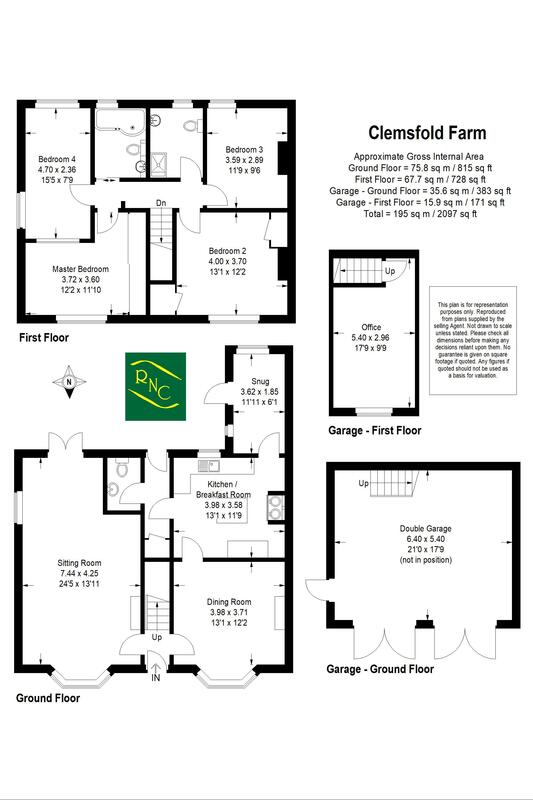 The detached double garage with versatile room above is another fantastic feature of the home. We highly recommend arranging to view the property in order to fully appreciate everything on offer. Heading south along the A281 from Rudgwick towards Horsham the property can be found on the left after approx 3 miles, just before reaching the roundabout at Clemsfold. Clemsfold is a small hamlet situated between Rudgwick and Horsham. The comprehensive market town of Horsham is approx 4.5 miles away with its mainline station to London Victoria, fabulous range of shops and restuarants and selection of schools both private and state. The property also benefits from being within a mile of Farlington School for Girls and within three miles of Pennthorpe Preparatory School. The renowned local gastropub The Chequers is within a brisk woodland walk or short drive and offers great pub dining. 9' High ceiling, bay window to front aspect, patio doors to the rear, feature fireplace with wood burning stove. Country style kitchen comprising; central island unit featuring wood work surfaces, selection of fitted units and a dresser unit. Dual fuel 'Range Master' cooker. Doors to rear lobby and snug. Double aspect, door to patio. Back door to patio, understairs cupboard. Comprising; contemporary wash granite wash hand basin with mixer tap, close coupled WC. 'L' shaped, double bedroom, featuring a selection of wardrobe cupboards with mirrored sliding doors, front aspect. Spacious double bedroom, front aspect, built-in wardrobe cupboard, further built-in cupboard housing hot water cylinder. Double bedroom, rear aspect, fitted cupboards. Comprising; panelled 'P' shaped bath with mixer tap and separate thermostatic shower over, glass shower screen, fitted units with recessed wash hand basin and mixer tap, concealed cistern WC, towel rail. Refitted modern shower room comprising; walk-in shower enclosure with Mira digital thermostatic shower, pedestal wash hand basin, WC, part tiled walls to wet areas. Gravelled driveway provides ample parking for several vehicles leading to the large detached double garage. Walled courtyard area provides a particularly generous outdoor entertaining space benefiting from a sunny southerly orientation, fully paved with attractive fishponds and mature hedge and brick boundary. Timber summer house. The plot is deceptively large with a mature garden filled with many well stocked flower beds and gravel paths around. A mixture of mature shrubs and trees provide privacy and screening from the road. Beyond the lawn are a further selection of raised beds and a greenhouse. This room could be utilised as a home office or possibly converted into an annexe/flat if required (STPP). LPG, mains water and electricity.